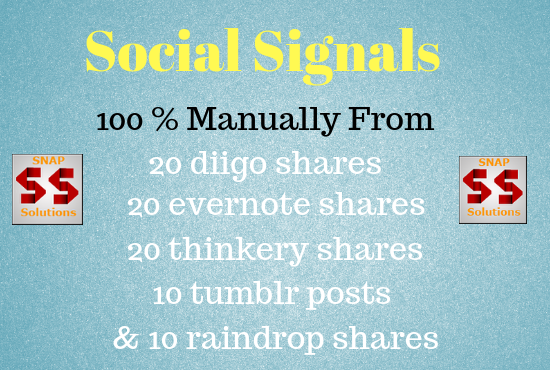 We will give you ( Social Signals / shares ) From 20 DIIGO , 20 THINKERY, 20 EVERNOTE, 10 TUMBLR, 10 RAINDROP Unique Profiles . for your site . Why THIS Social SIGNALS SERVICE ? Get You 20 DIIGO , 20 THINKERY, 20 EVERNOTE, 10 TUMBLR, 10 RAINDROP SHARES FOR YOUR URL is ranked 5 out of 5. Based on 29 user reviews.